The UK is rightly celebrated as the ecommerce nation. So, it’s puzzling that the premier department store in an emerging market like Peru should take the lead and introduce a referral programme ahead of the likes of John Lewis, House of Fraser, Selfridges, Debenhams and Harvey Nichols. 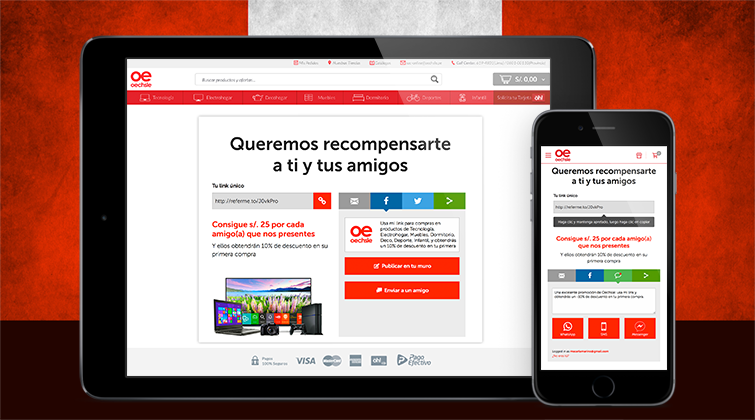 But that’s exactly what’s happening today, as Oechsle – part of Peru’s multi-billion-dollar Intercorp conglomerate – has gone live with their exciting new referral programme, powered by Buyapowa. That said, when you look back at Oechsle’s history, it’s a little bit less of a surprise. Since its inception way back in 1888, Oechsle has always been celebrated for its sense of innovation (it famously installed South America’s first electric lift!). With this launch, they’re continuing that tradition in the digital age, using Buyapowa’s cutting-edge technology not only to reward loyal customers but also to encourage and enable them to get their friends shopping, too. Given the enormous breadth of Oechsle’s offering – from playpens to PlayStations and scooters to computers – every one of those customers is certain to know dozens more potential shoppers. That’s why Oechsle are using Buyapowa’s unique tiered reward and gamification features to incentivise multiple referrals from every participant, with a sizeable store credit bonus for every fifth successful referral and a Samsung Galaxy tablet for the customer who introduces the most friends before the end of the week. Further campaigns will follow over the coming weeks and months, highlighting a wide range of product categories, from homewares to sports equipment and beyond. If you would like to know more about how we can supercharge customer referrals for your business, or just would like to chat a little about referral marketing then drop us a line.